You are here: Home / Squirrels / Does the Law Allow You to Kill Squirrels? Does the Law Allow You to Kill Squirrels? Squirrels are cute little furry creatures that most people love. Squirrels that devour flowerbeds, gnaw through the wiring harness of cars so they won’t start, burrow under water pipes, or wipe out a tomato or berry harvest overnight, however, may engender thoughts of squirrel-cide. In many locations, however, some species of squirrels are protected by law, and killing others may be impossible because of the danger to the squirrels that are protected. The most serious ramifications of killing squirrels usually fall on people who intentionally or accidentally kill squirrels that are school or town mascots. The city of Olney, Illinois in the United States, for example, bills itself as the “White Squirrel Capital of the World.” Motorists who accidentally run over an an albino squirrel in Olney may be fined $500. Intentionally trapping or killing albino squirrels would cause icy relations with neighbors at best and arrest on criminal charges at worst. However, many of the states that permit killing of game squirrels forbid the use of pellet guns to shoot squirrels. Many states require squirrel hunters to use shot guns to kill squirrels to be eaten or skinned for their fur. It is very difficult to remove all the shot from squirrel meat, leaving diners to chomp down on tiny bits of lead, and shot damages the pelts. It may also be unlawful to discharge a firearm within city limits. Most provinces in Canada restrict hunting of native squirrels. British Columbia, however, permits “humane” hunting of non-native gray squirrels every day of the year on both private property and Crown land. (You must have permission to hunt squirrels on someone else’s private land and you may not be permitted to use firearms within town or city limits.) In New Brunswick, squirrel hunting season runs from October through January, killing of all species permitted. In Newfoundland the season extends into February, and in Labrador, the squirrel hunting season runs from October until March. 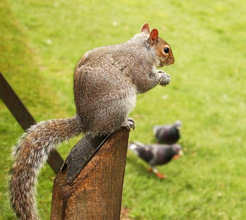 In the United Kingdom, the killing of squirrels as game animals is illegal, but the killing of invasive gray squirrels as pests is permitted. The Royal Society for the Prevention of Cruelty to Animals advises dispatching the squirrel by shooting or by a swift blow to the head. Citizens who kill even gray squirrels by drowning, suffocation, poisoning, bludgeoning, or electrocution may face arrest or fines. In the UK, pellet guns, shotguns, and rifles may be used to kill squirrels, but the user of the gun must be properly qualified and a shotgun or rifle must be registered and licensed. Pellet guns do not have to be registered, but they may not be discharged within 15 meters of a public thoroughfare and the pellets must not be shot on or over another property. Archery is an approved method for killing game squirrels in most of the United States except in the District of Columbia (where all wild squirrels are protected by law). It is also approved for killing gray squirrels in British Columbia any time of year and for killing wild squirrels during hunting season in New Brunswick, Labrador, and Newfoundland. Using bows and arrows to kill squirrels in the United Kingdom, however, is not permitted except by special license. Some breeds of dogs, such as whippets, naturally hunt rodents. They may kill as many as 20 squirrels in a single day, usually not consuming the animal. Allowing a dog to kill squirrels is usually permitted, but training a dog to consume squirrels usually is not. In cities where squirrels are protected by city ordinance (especially cities that promote tourism by identifying their squirrel populations are a tourist sight), dog owners may be required to muzzle their dogs in public places and to keep dogs out of unfenced yards. Social pressure on owners of hunting dogs may be intense. There are no jurisdictions in North America or the United Kingdom that permit poisoning of tree squirrels. There are no poisons that are registered for killing squirrels, that is, there are no poisons that can be lawfully used for this purpose. Even if poison were approved for squirrels, their extensive range, up to 10 hectares (25 acres), would require the use of enormous amounts of poison that would kill other wildlife and contaminate water supplies. When homeowners manage to kill attic squirrels with rat poison (unlawfully), the squirrel usually dies in a tight space where it was seeking to exit the house. Rotting corpses of squirrels in walls and crawl spaces can be difficult to remove without requiring major repair jobs and may cause a terrific stench for weeks or sometimes months. The exception to the rules for killing squirrels with poison usually is made for ground squirrels, especially when they burrow under or around houses, gas and water lines, playground equipment, and sidewalks. 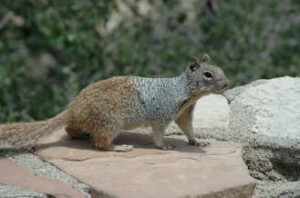 Some states also permit poisoning ground squirrels that threaten orchards and nut groves. A license for the poison is required, and use of poison will not be permitted if it would put endangered or protected species of related animals at risk. Electric fences do not kill squirrels or other small animals. They only give them an unpleasant and painful shock. “Rat zappers” are too small to trap squirrels that have matured enough to leave their nests. You might be able to rig up your own “squirrel zapper,” but you should not do this unless you are very knowledgeable of the use of electricity. It doesn’t do you any good to electrocute a squirrel and burn down your house. Squirrels can be killed with various kinds of snap traps. Rat or mouse snap traps are not large enough to kill squirrels. They are more likely only to maim the squirrel. Larger spring-operated traps are available from several companies specifically for killing squirrels. The Victor-Oneida Company makes a “Conibear” trap that looks like a rat trap stood on its side. Whenever a squirrel passes through any part of the trap, it snaps shut over its neck—if the trap is positioned correctly. If the trap falls over, it will only capture the squirrel by its foot. The squirrel may gnaw off its leg to gain freedom, and the severed limb may attract mice and rats. It is legal to kill squirrels with snap traps in most of the United States, with exceptions for Alaska, Hawaii, and Washington, D.C. The Conibear squirrel trap was invented in Canada, and in the province of Ontario it is actually illegal to use a catch and release trap for capturing and relocating animals, although it is legal to use the trap. In the UK, it is unlawful to use a trap that might capture a protected red squirrel—which makes using kill traps to control gray squirrels largely impossible. Killing squirrels, however, really is not necessary. You can use check valves and one-way doors to keep them out of your attic once they go out to forage. You can use various kinds of odorous agents and ultrasonic repellents to keep squirrels out of your home and yard. You may be required to relocate squirrels (as in Washington, D.C.) or forbidden to relocate squirrels (as in Ontario), but every jurisdiction allows you to put steel over squirrel holes in your dwelling and to put mesh over tender plants. And squirrels multiply faster than you can kill them. The best ways to get rid of squirrels are humane, for example using squirrel repellents. And if you are at wit’s end in your war on squirrels, try something simple. Set out food and water where you want squirrels to go. They will usually comply. Click the link to learn more about how to get rid of squirrels in your backyard or this link to read an article about How to Get Rid of Squirrels in the Attic. Squirrels come in lots of different shapes, sizes and colors. 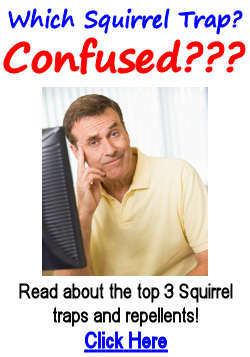 Read these not so well known facts about squirrels, you may learn something new. I along with others rent a home in Framingham Ma. Recently my two neighbors directly across me and another next to our rented home had a pest control extermination on the same day! I thought nothing of it until I felt nauseous for two days. The following day i also found a dead squirrel in my drive way! I recognized the squirrel. The following day another one in my driveway again! Then I knew that they were posioned! I saw at least five to seven squirrels dead around the neighborhood. This greatly sadden and concerns me? Is it safe to be outdoors? I have a small dog and have family and friends who come over with their small children and dogs? I love animals and wildlife! The two neighbors across me live next to a reservoir! Tonight, I hear an animal desperately crying in their back yard near the reservoir! It is quite disturbing! What can be done? I am concerned for our safety out doors and for the wild life around us? is it okay if i kill suqirrels with my bare hands as long as i am not caught? If you are worried about getting caught, then it probably isn’t okay. I have litterly hundreds of squrells on my land, at first I trapped and released some miles away, as soon as I would get rid of one two would return. I have been plinking for some years with an RWS Diana that I rebuilt with an aftermarket spring and seals, it cronys at 1425fps,using this gun along with steel sabboted pellet is amazing, rifle is also scoped with a Leupold and is accurate to 80to90 yards, I target shoot asprin so I can ses the white puff when I get a hit. So as for the squrells I will only take head shots, one shot one kill. I figured a single shot spring gun will give the squerall a sporting chance, all squrell meat is donated to the coydogs that also live on my land. Nothing like pulling a squrell 300feet up a tree. Its my land and guns are plentiful if I wanted I could be using a 3030 or shotgun, but I like the idea of a minimalist weapon that takes testing and skills. If you like rodents and want to protect them, sorry guess I gong to hell. Live free or die. I live with someone who bought a pellet gun to kill squirrels because they are eating the bird. seed she puts out , I’m severely irritated by this disgusting behavior, I feel like she’s being a malicious animal killer and I asked her to please not kill them and she got mad and told me that they chewed the wires in the house , well I’ve been living here for five years now and there hasn’t been one episode of them chewing any wires ,so my neighbor has a dog that comes and retrieves the dead animal and he eats it then goes home and proceeds to get sick all over our elderly neighbors house. Explained this to her and she laughed! I’m not only disgusted but I’m heart broken also ,,what can I do????? If your neighbor is causing the squirrels to suffer, ie not killing them humanely, then she could be breaking a local law or causing a health hazard by not disposing of them correctly. You could try checking that out. First you should make a suggestion to remedy the situation, like using vaseline to cover the hanging pole or chain of the bird feeder, so they will slip off and not be able to get at the seeds. If there is no apparent solution to the problem, then buy a $20 live trap and catch them before she does and take them to a far away park to release. Squirrels can cause property damage, from homes (electrical, structural, etc.) to gardens (uprooting any plant and killing it) and in general be pesky and annoying. You should try to be proactive and not reactive, many people see it wrong to kill insects that enter the home too! Unfortunately, most states do consider many kinds of squirrel both game and nuisance animal, and many allow the taking of these nuisances without game licenses. Rather than starting a feud with your neighbor (seriously bad way to go if you haven’t already), then take matters into your own hands and trap them or talk her into squirrel-proofing her feeder (many ideas available on the internet). Besides, the more you try to FORCE people to see the world through your eyes the more resistance you may be met with.